Maria and Sebastian Gaytan cheer as The American Legion National Convention parade passes down Nicollet Avenue in Minneapolis. Photo by James V. Carroll. 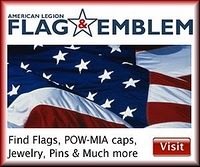 It’s always a big source of pride for Legionnaires to march in the national convention parade. But for Department of Kentucky Alternate National Executive Committeeman Randall Fisher, it was an even greater source of pride this year. Fisher helped carry the department’s banner as Kentucky led off the procession of contiguous U.S. departments in Minneapolis Sunday afternoon (Aug. 28, 2011). The Bluegrass State earned the honor by finishing first in membership for the 2010-2011 year; the department had been 52nd the previous year. With the temperature hovering around 80 degrees and humidity virtually nonexistent, it was a perfect day for the parade. Its 89 units included classic cars, trolleys, the Legion’s Spirit of Service winners and youth champions, Miss America Teresa Scanlan, nine bands and delegates from every Legion department. The American Legion Riders, three days removed from another successful Legacy Run, led off the event. Retired Brig. Gen. Denny Lord was the parade’s grand marshal; immediate Past National Commander Clarence Hill was honorary grand marshal. The spectators agreed. 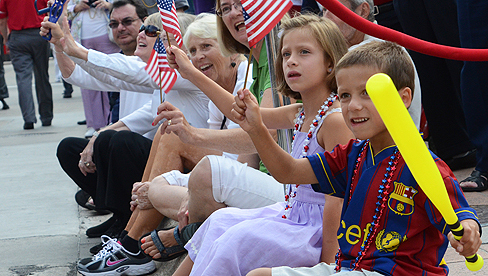 Legion family members and locals lined beautiful Nicollet Avenue, waving flags and cheering on parade participants. Two such fans were 5-year-old Sebastian and Maria Gaytan, the children of Peter Gaytan, executive director of the Legion’s Washington Office.